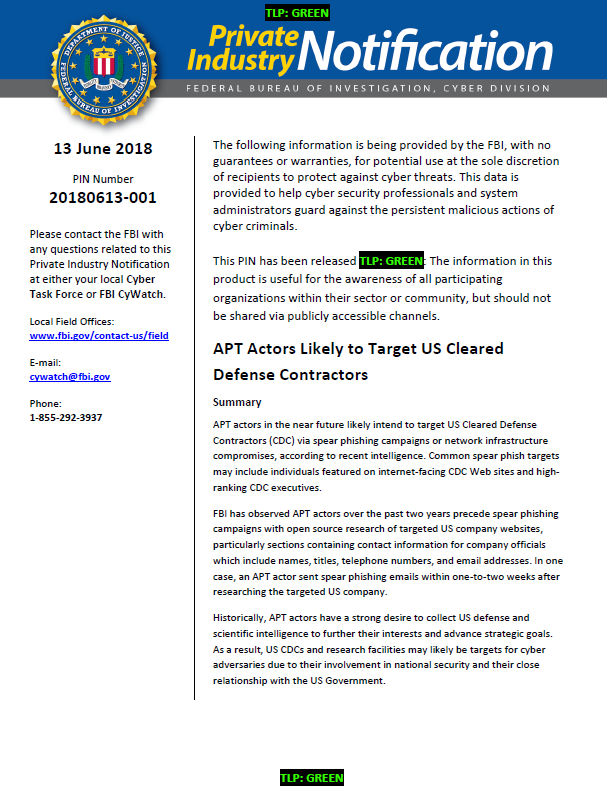 FBI has observed APT actors over the past two years precede spear phishing campaigns with open source research of targeted US company websites, particularly sections containing contact information for company officials which include names, titles, telephone numbers, and email addresses. In one case, an APT actor sent spear phishing emails within one-to-two weeks after researching the targeted US company. Historically, APT actors have a strong desire to collect US defense and scientific intelligence to further their interests and advance strategic goals. As a result, US CDCs and research facilities may likely be targets for cyber adversaries due to their involvement in national security and their close relationship with the US Government. Most companies publicly share their contact information and high-level management names on their corporate Web pages. Some corporate employees share other forms of personally identifiable information on various social media platforms. Adversaries may use this publicly-posted information to target individuals with the end goal of infecting a corporate network for intelligence collection. Common techniques used by APT actors include sending well-crafted spear phishing messages tailored to the professional interests of the target, the use of watering holes to redirect visitors to malicious Web sites, and the use of stolen or weak user credentials to exploit a network vulnerability. After a successful compromise, APT actors attempt to expand their access in the network to multiple systems to facilitate information theft. APT actors have increased their activity over the last several years. Cyber attacks such as WannaCry and NotPetya in the spring and summer of 2017 are examples of increasing APT activity. While WannaCry and NotPetya were not directed at the United States, both had inadvertent negative effects on US systems. The FBI advises companies to be mindful that similar attacks may likely occur in the near future. Previous attacks have coincided with national holidays of cyber targets, such as Constitution Day in Ukraine on 28 June.